“Now from the sixth hour there was darkness over all the land until the ninth hour. And about the ninth hour Jesus . . . when he had cried again with a loud voice, yielded up the ghost . . . and the earth quaked, and the rocks rent; and the graves were opened and many bodies of the saints which slept arose . . . Now when the centurion, and they that were with him, watching Jesus, saw the earthquake, and those things that were done, they feared greatly saying, Truly this was the Son of God” (Matthew 27: 45-54). This awesome event, described only by Matthew, is the artist’s second subject for None. According to Luke’s gospel (23:45) the sun was darkened, and the scene is bathed in an unearthly blue-gray light, such as falls on the earth during an eclipse (a nearly total one was visible in northern France in 1406 at about the time this painting was done). Into the gloom strikes a shaft of supernatural light. Rocks have been split and three of the dead emerge through cracks in the earth, raising their hands in supplication. An armed guard at the foot of the cross, still grasping his spear, falls back against his terriﬁed comrades. 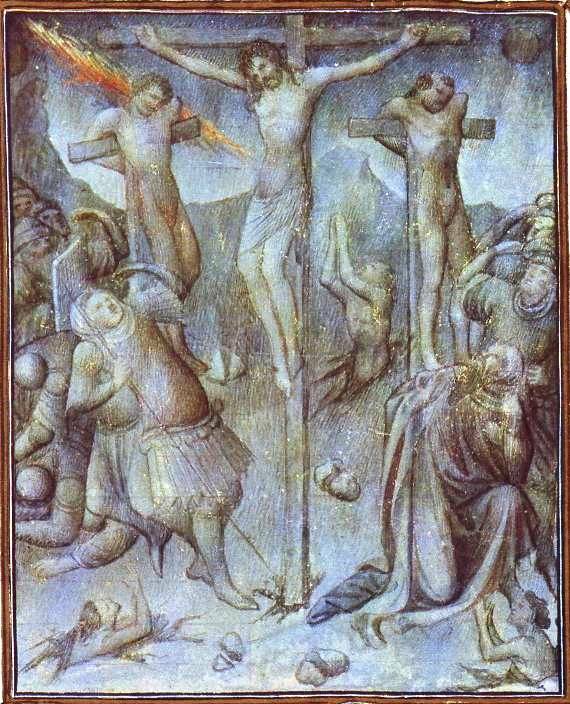 The kneeling centurion and a group of spectators look up in amazement toward the source of the yellow and red light that passes behind the repentent thief and comes near the side of the cruciﬁed Savior. No earlier painting had offered so impressive a depiction of darkness at noon. The artist did this by developing the common mode of grisaille (painting in tones of a single colour, especially grey). He laid his blue-gray strokes over a lighter ground, producing a kind of shimmer. This ground is warmer and lighter in the flesh areas, and brick-red in the falling guard. The same red lies in the shadows of the mantle of the kneeling centurion. The artist here proves to be a subtle and resourceful painter.